A panel of experienced caregivers in foster care or adoption answer pertinent questions asked by panel emcee Amy Cordova, far right. EDMOND—Today there are approximately 8,500 boys and girls in DHS custody in Oklahoma, representing a staggering foster care crisis. The event was an equipping conference presented by the Baptist General Convention of Oklahoma (BGCO) and Oklahoma Baptist Homes for Children (OBHC) and featured a wide array of speakers, videos and resources related to foster care ministry. The event began with a welcome from BGCO Executive Director-Treasurer, Hance Dilbeck, and President of OBHC, Greg McNeece. 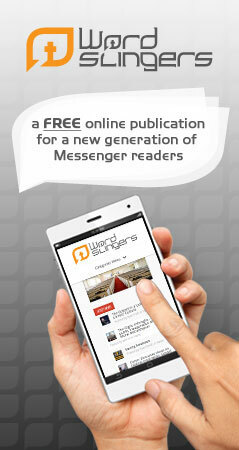 “The one that we call Master said come to me and I will give you rest,” said Dilbeck. “When I think of foster care, I think of that verse of Scripture in Matthew. That sounds like what a foster family does to me. Come to me you who are weary and I will give you rest—Saftey, peace, love and rest. That’s the heart of the Master, so it should be the heart of those of us who are following the Master,” Dilbeck said. 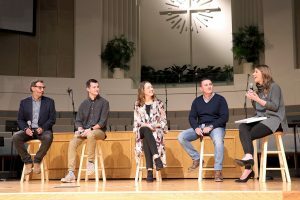 A panel of pastors who created a culture to support foster and adoptive families in their churches discussed how they called upon their congregations to become champions for the cause. On the panel were Charlie Blount, pastor at El Reno, First; Cody Brumley, executive pastor at Jenks, First, Brumely’s wife Breanna who is leader of the WRAP foster care and adoption ministry at Jenks, First and Alex Himaya, pastor at TheChurch.At. Following the panel discussion, A foster care child simulation led by 111 Project took place, in which attendees to the conference were instructed to follow a video prompt. The prompt told everyone to get into character and pretend they were a child named Sophie. Russell Moore discusses the difficulties that can come with being involved in foster care or adoption. They then followed Sophie’s foster care journey, which began with gathering her and her brothers’ belongings in trash bags and moving from one place to another, eventually having to be separated. The simulation was a picture of what it is like for a child entering the foster care system. 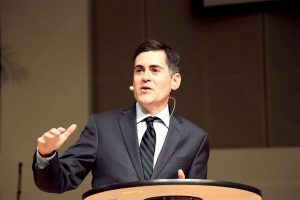 Russell Moore, president of the Ethics and Religious Liberty Commission was the featured speaker at the foster care rally. Moore discussed the difficulties that can come with being involved in foster care or adoption. To conclude the service, a time of response was observed in which those who attended could indicate their interest in becoming foster parents, starting a foster care ministry at their church and praying for the foster care crisis in Oklahoma. Both before and after the rally, attendees could visit the event exhibit hall, which featured representatives from the 111 Project, DHS, Cherokee Nation and others. For more information, or to view videos from the event, visit www.bgco.org/foster.